8 national championships have been won, including in 2007. * Counting best 4 of 5 scores. ** Formerly Pac-10 or Pac-8 Conference. *** Includes NCAA Championship Stroke play portion. Tradition Award - given to the player exhibiting leadership, strong work ethic, academic excellence, and an overall appreciation of the traditions of the University and Stanford Men's Golf. "The Spooney" Award - given to the team member with the most tenacity and a never give up attitude. * Detailed records prior to 1992 are not available. From the 1930s into the 1970s few college tournaments were held as most teams played 2 or 3 school matches so individual wins were so limited. Bob Rosburg 1947-1949 ? 1? Bud Brownell 1940-1942 ? 1? Warren Berl 1938-1942 ? 1? Frank McCann 1938-1942 ? 1? Art Doering 1938-1940 ? 1? Don Edwards 1932-1934 ? 1? Lawson Little 1932-1934 ? 1? Charles Seaver 1932-1934 ? 1? Malcolm McNaughton 1929-1933 ? 1? For many years Sandy Adelman has been recorded as the 1969 conference co-champion (as the Pac-12 conference records indicate today). 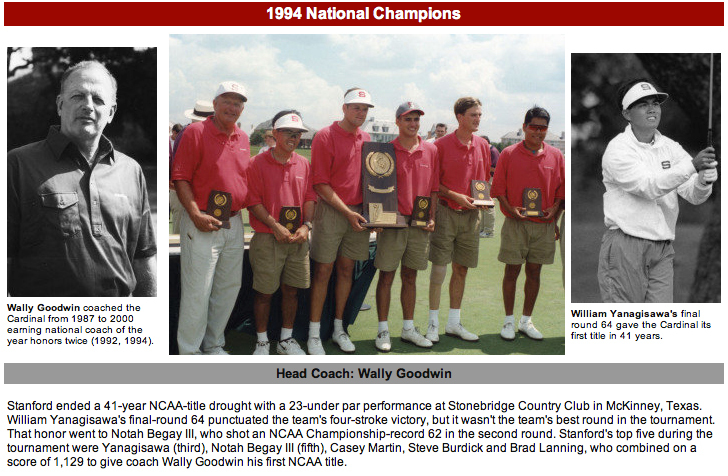 In response to a Nov 2012 question to notable Stanford players about records shown on this web page, Sandy pointed out he finished 1 shot behind the co-leaders. Sandy shared this story with photo about the final hole of the tournament.